Her remarkably naturalistic portraits of animal subjects are depicted on a clean white background, which not only creates a dramatic graphic image, but conveys her modern aesthetic. Each image has an almost snap-shot quality, showing her unique ability of capturing the personality of each animal and imparting humour, character and whimsy to many of her pieces. "I have always seen the human side in animals - the way they make you laugh or sympathise with them with an action or an expression. I paint mainly from my own photos but can sometimes spend hours watching the subject as it's all about capturing that single moment." Dominique Salm frequently travels to Kenya where she spends hours studying her subjects. On a recent trip, having noticed how the elephants vary in shades of red from rolling and spraying themselves in the rich soil out there, she came up with the idea of using the actual earth as a pigment in her paintings to convey this. 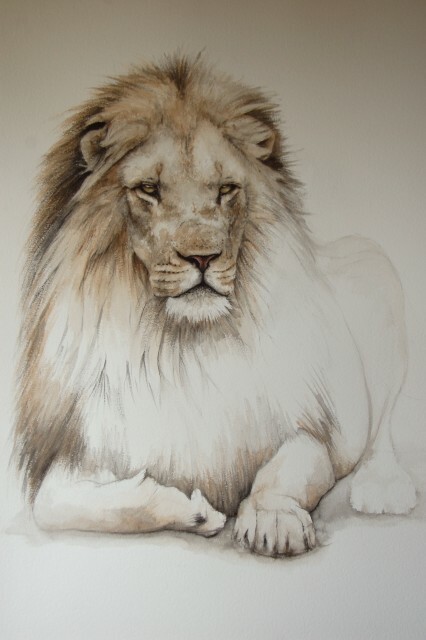 Dominique has quickly become a highly acclaimed wildlife artist and consequently her paintings are now highly sought after by private collectors and art dealers worldwide. She frequently exhibits in both London and New York, has been shortlisted for the David Shepherd Wildlife Artist of the Year in several years in a row and is winner of the BBC Wildlife Artist of the Year 2009, World Mammals category.